Scotland will be without Mark Bennett against Tonga after the Glasgow Warriors centre damaged a hamstring during the 24-16 defeat by New Zealand. 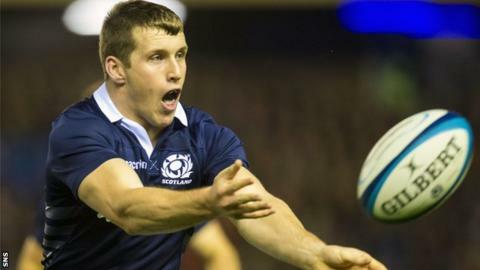 The 21-year-old, who has started Scotland's two autumn internationals, has returned to his club for further treatment. Nine other players also require attention after the bruising encounter. Among them are points scorers Greig Laidlaw and Tommy Seymour, who both suffered hand injuries. Glasgow winger Seymour scored Scotland's only try, with Gloucester scrum-half Laidlaw kicking all the other points. Centre Alex Dunbar is joined on the treatment table by Glasgow team-mates Adam Ashe and Euan Murray. Murray's fellow prop, Alasdair Dickinson, requires examination along with his Edinburgh team-mate, Ross Ford, and two more forwards, Blair Cowan of London Irish and Richie Gray of Castres. Scotland host Tonga on Saturday at Rugby Park in the last of their autumn Tests, having opened with a 41-31 win over Argentina.